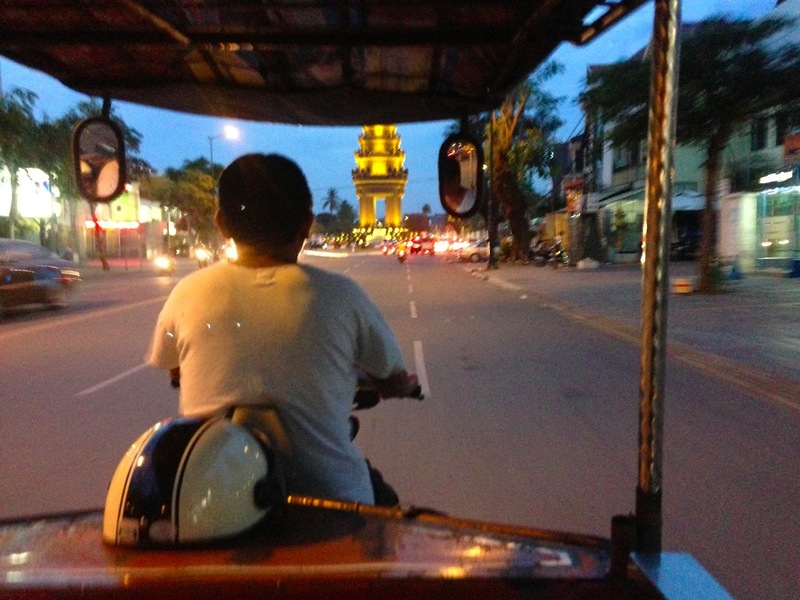 Our first impressions of Cambodia are...I love it!! Phnom Penh feels vibrant (in a way that Bangkok felt crazy) and the people are friendly and warm. The city has a very french feel, with wide, tree-lined avenues and a beautiful embarcadero that lines the river, where locals and foreigners dance, picnic, and play. Sure, the traffic is insane, there are no sidewalks for walking because they're all parking lots or have scooters on them (trying to avoid the traffic), and it's so hot. But I totally love it! We got to our little Monument Hotel and were met by the delightful young receptionist, who looked at our passports and said, "Obama was here! We love him! He bought hamburgers. What a great man." In addition to this being more composed English than we heard over the last month in Thailand, he was able to explain that the Cambodians love Obama because, unlike their prime minister, he went to a local shop and bought burgers for everyone. When we commented on his excellent English, he said that Cambodians learn English from a young age because they know that if they are going to be important in the world, they need to know English. And every night in the lounge, they show educational documentaries about the Khmer Rouge and the fallout (except on Mondays when they show a national geographic documentary about Angkor Wat). And it's happy hour and for $1, they delivered a pint of draught beer and a ginger ale (Cory's caught a bug) to our room…with a smile! So far totally pleased with Cambodia!